A strong majority of the voters surveyed say they can afford a higher tax, especially if it addresses the mounting delays that have brought South Bay Area freeways to a grinding halt. (TNS) -- Buoyed by a survey that shows growing support for a new transportation tax, Santa Clara County officials will ask voters to support a half-cent sales tax increase for 30 years to extend BART, fill potholes, upgrade numerous aging interchanges and fund bus lines. A survey released today indicates that 69 percent of likely voters in November would support a tax hike to fund nearly $6.5 billion in transit and road upgrades in Santa Clara County. This not only surpasses the two-thirds majority approval needed, but it also represents the highest level of support since the Silicon Valley Leadership Group began polling voters over the past few years. A strong majority of the 600 voters surveyed say they can afford a higher tax, especially if it addresses the mounting delays that have brought South Bay freeways to a grinding halt, diverted traffic onto jammed city streets, led to standing-room-only cars on Caltrain and left local roads in desperate need of repairs. "It's looking more and more that this is the right place, right time" for another tax proposal, said Carl Guardino, president and CEO of the Silicon Valley Leadership Group, which strongly supports the tax and commissioned the survey by J Moore Methods. The last time county's voters taxed themselves for transportation, it was Measure B in 2008, which levied an eighth of a cent tax for BART.Perhaps as significant, only 6 percent oppose the tax, down from 25 percent in earlier surveys. The poll was conducted from April 23 to May 1 and has a 4.2 percent margin of error. The Valley Transportation Authority, which is the region's governing body on all transit matters, will vote June 2 on a priority list of projects for the proposed November ballot measure. If approved, the measure would raise the county sales tax from 8.75 percent to 9.25 percent, just shy of the maximum 9.5 percent allowed under state law. The tax would generate $200 million a year, with the top priorities being repaving streets, extending BART through downtown San Jose and upgrading Caltrain from Gilroy north to the San Mateo County line. Another big chunk may be used to rebuild interchanges like highways 85-237, 85-280 and 101-De La Cruz Boulevard. And the convoluted Lawrence Expressway may be in for a massive change -- more lanes, overpasses and underpasses to cut down on long waits at Stevens Creek and El Camino Real. 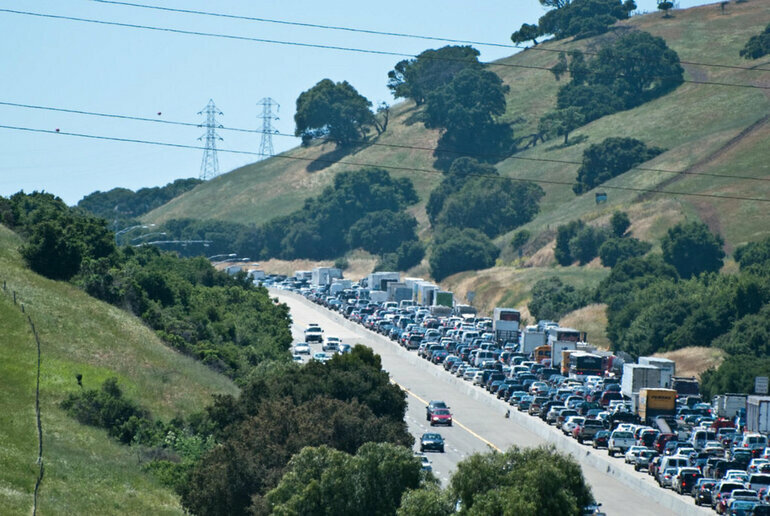 "Our region suffers from some of the worst traffic congestion in the country, leaving our residents with long commutes and constraining the growth of our economy," said San Jose Mayor Sam Liccardo, who is a voting member of the VTA board. "We need real solutions that will bring relief to our traffic challenges." There has been only a smattering of opposition. Santa Clara County Supervisor Joe Simitian, of Palo Alto, wants to make sure BART doesn't eat up most of the funding after it received the bulk of it in measures approved in 2000 and 2008. That, he said, left "precious few resources for other forms of congestion relief throughout the county. ... Ensuring that there will be some limit placed on that portion of the proceeds funding BART to San Jose, something like a 25 percent cap -- enough to get the job done for BART to San Jose, but not a blank check." No project would be fully funded, with financial assistance needed from Congress and the state Legislature. This is common; four years ago the Federal Transit Administration sent $900 million to the VTA to make up for a funding gap in the BART extension from Fremont to Berryessa now under construction. More than 600 projects worth $48 billion were submitted for consideration to the VTA. Supporters of the proposed tax say the local dollars will generate millions more in aid from both the federal and state governments. BART, for example, would get $1.5 billion from a local tax while another $1.5 billion in federal aid and $750 million in state funds are being pursued. After the June vote on what projects make the cut, the measure is expected to be approved in August for the November ballot. Up first if voters say yes? Repaving. "The highest priority for taxpayers and voters is the crumbling condition of our local streets and roads," Guardino said. "And that can start almost immediately."